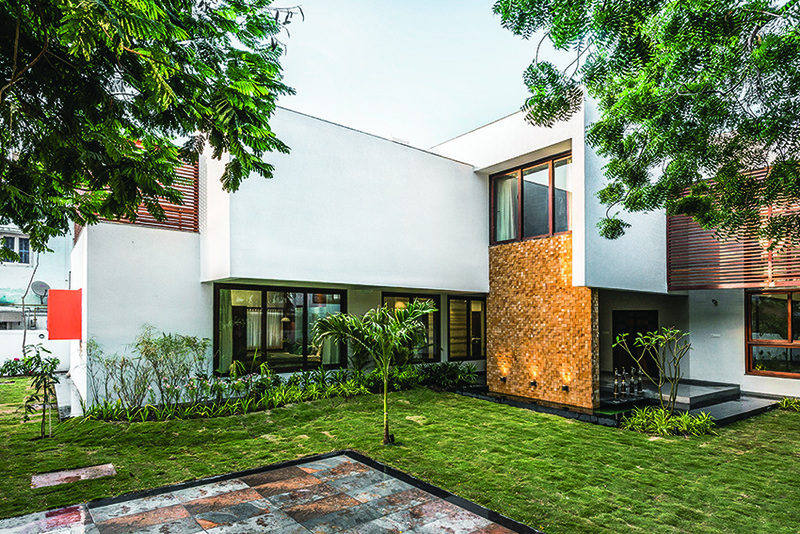 The shape of L House — which now nestles within a plantation of climate-correct vegetation — was partly the result of retaining three huge local trees with extensive canopies. The sensitivity to the environment informs the facade cladding as well, with its swathes of light-washed expanses. Intersecting rectangular and square volumes have resulted in a cleanlined architecture with extrusions and voids. The louvres, which are an integral part of the elevation, too, act both as sun breaker and visual screens, creating a sheltered, private appearance. “The designing of a home is apparently designing a lifestyle. It is not only the bringing together of soil, climate, material but also centres around the lifestyle of the people who will habitat that dwelling. 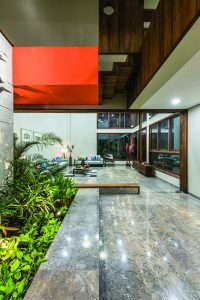 For each design and client, there is a unique combination of influences — people, places, events, memories and perceptions,” say architect Snehal Suthar and his spouse and partner interior designer Bhadri Suthar who together lead Ahmedabad based The Grid Architects. The subject crops up while discussing L House, one of their recent projects which beautifully illustrates the duo’s respect for the earth and their recognition of the universal spirit that resonates within each and every material. This project, too, was partly shaped by site conditions — the presence of three mature local trees, to be specific, which they were loath to destroy. “The plot is at a cul de sac, sited in a densely-populated residential area; a flat piece of land dotted with a number of trees. The retention of three huge local trees with widespread branches became a design driver,” elucidates Snehal. 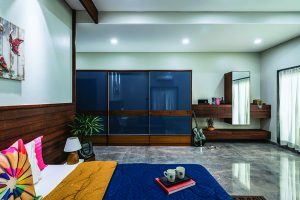 “While we tried to fulfill all their requirements, what ignited our minds was staying true to the site/earth/atmospheric settings.” The short time frame apart (they’d only one year to deliver the project from scratch) saving the trees was the most challenging aspect of this assignment, highlights Bhadri. “We tackled this by planning and conceiving all architecture and interior details and the material palette at the planning stage to save time,” she says. 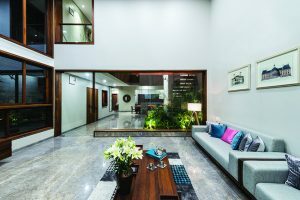 The expansive living room affords green views, owing to the proximity of the landscaped courtyard and the presence of large windows that welcome the surrounding verdure into the enclosed spaces. 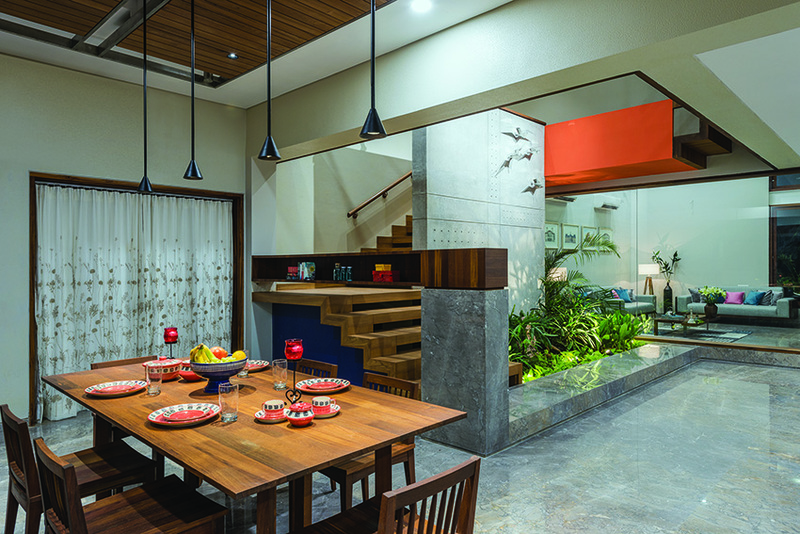 The second consideration that influenced the architectural response was the client’s request for the kitchen to be centrally located such that it would be in line of sight of the main door, and the dining and living rooms… “Basically, it had to feel connected to the events unfolding in the rest of the house. The low-rise dwellings around the site and the bylaws of the city were other influencing factors,” expound the creative leaders at The Grid Architects. Before we dwell further on the architecture and interiors, a word about the landscape: the house nestles within a lush, verdant cocoon painstakingly rendered from — in alignment to the Suthars’ green bent of mind — carefully-curated, climate-correct plantation. The presence of water — as a small reflective pool near the entrance — adds that gentleness to the experience that only water can. Customized lights that wash the exterior stone-clad walls heighten the organic feel. Architecturally speaking, the form was derived out of a grid-based plan that played with intersecting volumes and clean, fluid lines. “The design is directed towards simple, stark clean and uncluttered interiors and volume of spaces. 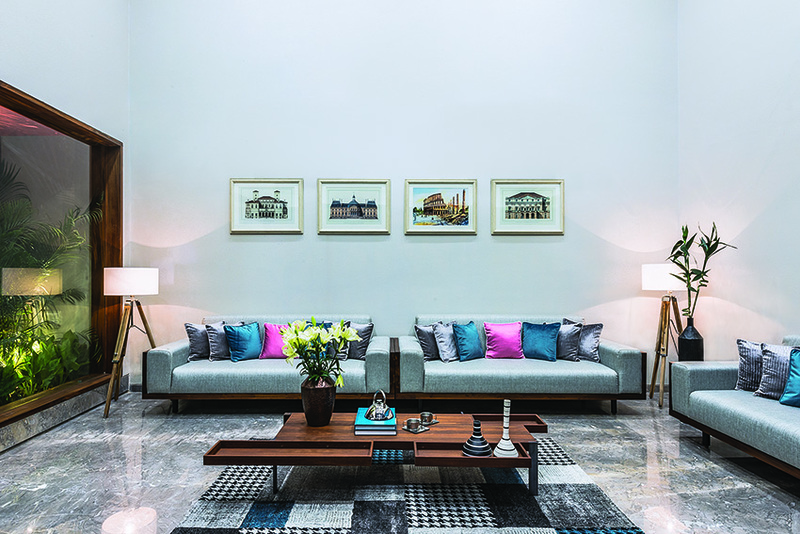 There is a fluidity of spaces with a certain dependence between them, which helped the semi-private and private spaces to be interactive, triggering diverse sensations and moods to encourage communication,” disclose the Suthars. 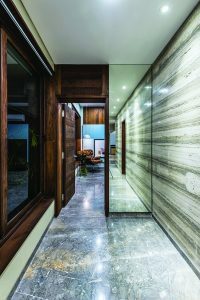 The team eschewed ostentation and opted for minimal material and colour palettes featuring wood, concrete, natural stone and white. 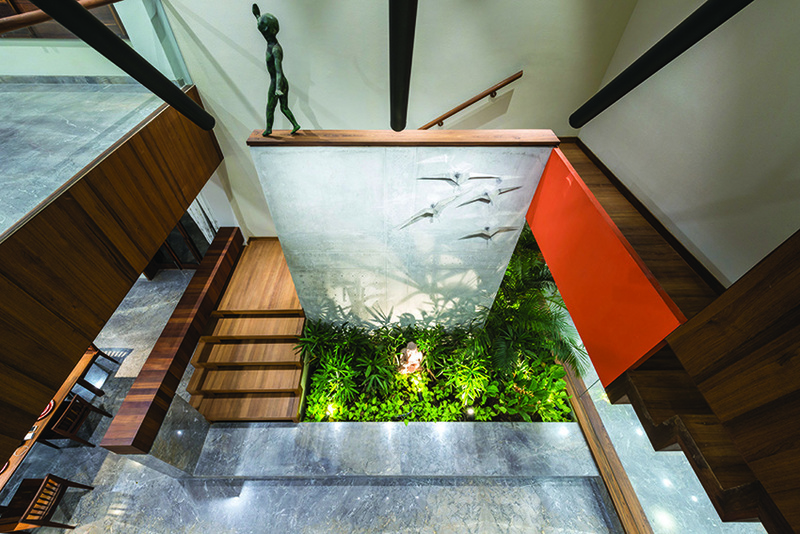 Beyond the thick, pure teak main door is the courtyard — the highlight of the house — a double-height volume graced by a customized 3D mural depicting birds in flight to infinity on an exposed RCC wall. Its lightness of spirit is echoed by the sculpture of a little boy delicately balanced on a ledge and the calm features of a Buddha, seated among refreshing greens. A trio of bespoke lights, angular and unfussy, drop down from the ceiling and break the verticality of this volume. The lofty volume of the courtyard threads the peripheral areas into a cohesive programme, with the spatial intersections and interactions woven into a smooth, aesthetic whole. The visual compositions are barrier-free; the space frames are attractive, triggering a desire to live there. Around the courtyard are orchestrated the remaining of the areas on the ground floor: to the right, a living room; across it, the kitchen dining area, which extends, via a deck, into the surrounding landscape. Dressed in cool blues (in response to the harsh south-west sunlight) and wood, the living room features an installation of uniquely designed lamps made up of essentially wood and latticed with cane work, hung from the double height of the living room in a cluster of three distinctively integrated formations to throw light softly. The double-height glazing has been camouflaged by wooden louvres on the exterior side to break the harsh sunlight from the south-west. 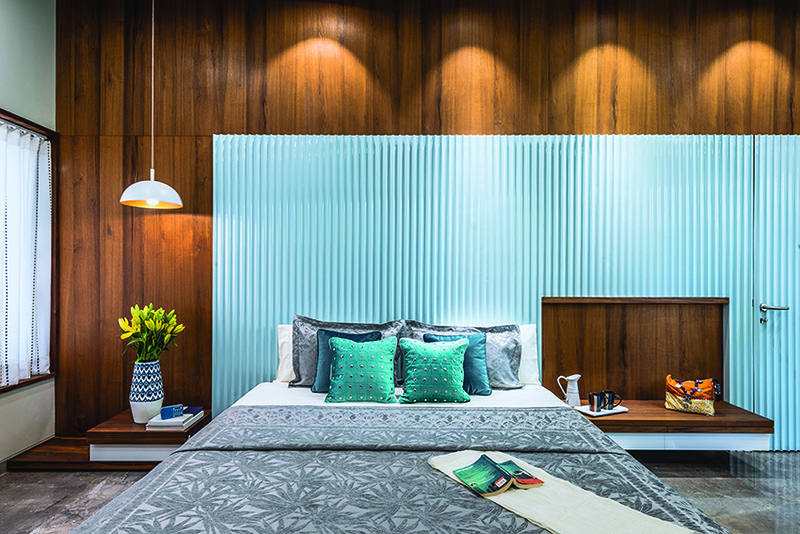 These louvers are an integral part of the elevation too, and thus become a wooden curtain with dual functionality. A corridor near the dining area takes you to the master bedroom which is located on this level. The connection to the outside is maintained along this approach too, thanks to the gardens views from the large windows and the sunlight that spills inside. A painting of the first watercolour sketch of the design concept of the villa, mounted on a ribbed sky-blue wall (part of the master bedroom), functions as a visual anchor from the corridor itself. A top view of the double-height courtyard. The sculpture of a little boy doing the balancing act adds an endearing touch. The staircase, located adjacent to the courtyard leads to the upper level that overlooks the living room, dining area and the main entrance. 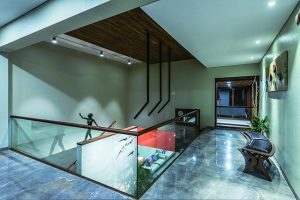 “Thus, it acts as a bridge around the house, a centrifugal force,” emphasizes Bhadri. Both the bedrooms of this storey enjoy satiating views of the surrounding garden. 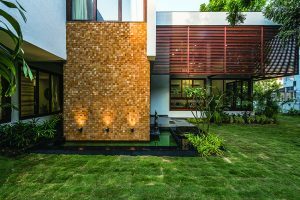 The terrace garden, which is attached to the larger of the two bedrooms, is enclosed by a visual barrier (as the terrace is directly connected to the road) of wooden louvres — which gives it an air of delightful seclusion. Notwithstanding the pressures arising out of short delivery timelines, the design team ensured that L House stayed true to its core philosophy of being gentle on the earth as well as paid meticulous attention to detail. “The process stressed on everything local, where man and material were concerned. Essentially all the rooms receive sunlight and natural breeze almost throughout the day resulting in optimal ventilation yielding in a comfortable internal environment. Hot air from the south west is restrained by the surrounding landscape. 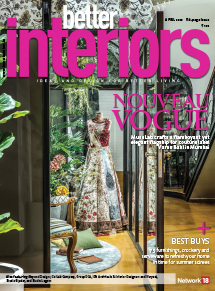 Both exterior and interiors use lead-free, environment-friendly, nontoxic, water-based paints,” reveals Snehal. The private spaces exhibit the same clean-lined forms as the rest of the house. The idea was to be simple, elegant, unpretentious in architectural articulation as well as the interior treatment. Attention to detail is illustrated by a recycled wood and metal centre table that smartly makes into account storage needs for paraphernalia such as remotes, mobile phones and newspapers; customized lamps rendered out of metal (in the courtyard) and cane lattice (living room); kitchen shutters which are clad in 3-mm-thick tiles; innovative concrete planters for the terrace; and the aforementioned 3D mural of the courtyard. 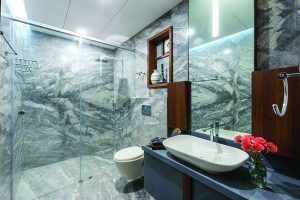 To create a living experience that would be tailored to the clients’ lifestyle and also staying true to the atmospheric settings. 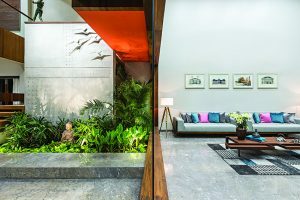 In the courtyard, a customized mural of birds in flight against an exposed RCC wall, imbues the space with effervescence, and is aligned to the serene lightness on the Buddha’s visage. The adjacent living room area is peppered with cool blue, to offset to harsh south-west sunlight and balance the warmth of wood. The landing of the first level. The trio of clean-lined minimal light fixtures have been specially designed for the project. Walking along the corridor is akin to strolling in a garden, thanks to the huge glass windows.